While we’d normally swat a rogue insect in our home, the latest design trend has us welcoming creepy crawlies with open arms… well, sort of. Spotted within the latest crop of freshly unveiled decor collections, we’ve noticed bugs, beetles, and flies to be a consistent motif throughout. These interpretations of bugs, beetles, and various other critters are decidedly less literal in form. Instead, they’re reimagined with whimsy and charm, bejeweled with luster and elegant flair. Ornate beetle sculptures are leading the charge with this trend, inspiring a fresh perspective to what one may consider a decorative object. Should you still find yourself somewhat averse to the concept, consider these stunning examples—they’ll have you buzzing in no time. Designed by Jonathan Meizler, these handmade figurines are crafted from oxidized sterling silver, which results in a dynamic finish that will patina over time. Versatile in application, you may place these little critters just about anywhere in your home. 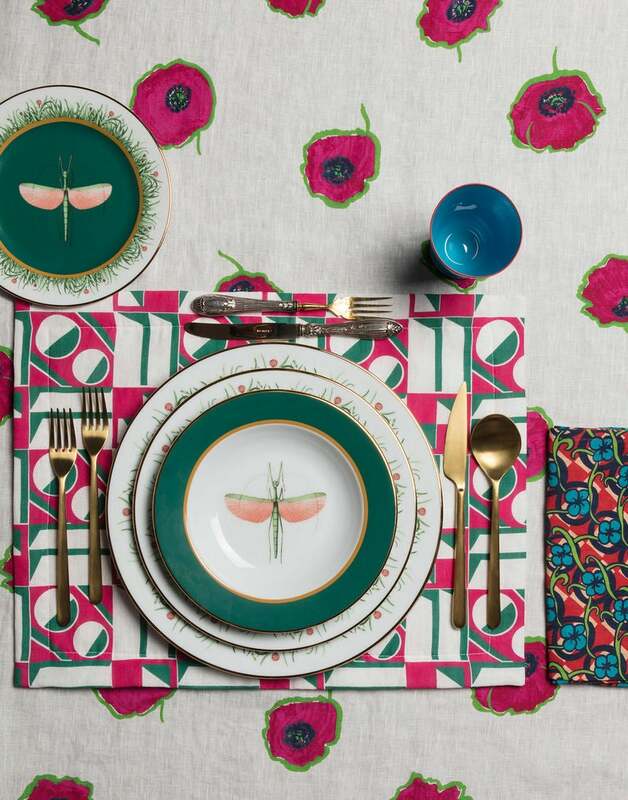 Switch up your standard dinnerware rotation with this hand-painted gold-rim plate set that boasts a not-so-subtle and chromatically detailed ode to dragonflies. There is something to be said of cheeky cocktail napkins embroidered with whimsical sayings or illustrations. This bug-themed rendition promises to be quite the conversation starter. If you find yourself ready to fully commit to the trend, this artful figurine is one way to start. Hand-blown from Murano glass, the intricacies and color elements of this piece are simply captivating. We’re making a beeline for this one—Fornasetti’s iconic candles are a decorative staple in their own right, and this bumble bee–themed version is no exception. Leave it to Gucci to serve us with a three-dimensional incense burner that challenges all preconceived notions of what one should look like. Scalloped edges and a toile-detailed inlay set the groundwork for the cleverly camouflaged beetle on top. Consider this one an abstract interpretation of the trend—prime for those who aren’t ready to take the plunge with the full-on bug look. The delicate lines of this beautifully illustrated set employ an inspired use of color that plays off the whimsical nature of the motif. Brush up on your entomology with this playfully embroidered linen throw pillow and give your current bedding lineup the trendy revamp it deserves. With its iridescent finish and detailed composition, this brass rendition of a desktop staple definitely holds a lot more weight.